The Gunners are currently three points behind fourth-placed Chelsea but they can leapfrog the Blues with a win, given their better goal difference. Bernd Leno should retain his goalkeeping role for the Premier League after sitting on the bench for the midweek Europa League clash. The German will be hoping to keep his first-ever Premier League clean sheet on the road. At the back, Emery is likely to stiff with a similar combination from recent weeks, given the lack of depth due to injuries. Laurent Koscielny, Nacho Monreal and Shkodran Mustafi are the likely trio to feature in a three-man backline with Sokratis suspended after picking up a two-match domestic ban for accumulating 10 yellow cards. Ahead of the trio, Ainsley Maitland-Niles and Sead Kolasinac seem likely to retain their roles in the right and left wing-back positions respectively. Carl Jenkinson remains a probable option to replace the former, but Emery may not take the risk with the Gunners in need to a victory to enhance their top-four prospects. In the midfield, Emery is likely to rotate his options with a view to the second leg of the Europa League quarter-final against Napoli. 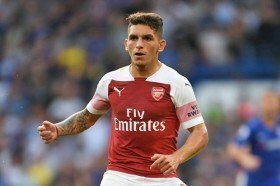 Lucas Torreira should be fresh to feature after his recent three-game domestic ban and we are fancying him to partner Matteo Guendouzi. Granit Xhaka remains doubtful with a groin injury while Aaron Ramsey could feature off the bench after his tireless first leg performance against Napoli. In the frontline, the manager may prefer a reshuffle of the attackers with Mesut Ozil and Pierre-Emerick Aubameyang dropping to the bench. Alex Iwobi and Henrikh Mkhitaryan are likely to feature behind the main striker's position which could be occupied by Alexandre Lacazette. The Frenchman needs to produce a strong showing after being guilty of squandering a clear-cut scoring chance in the recent 2-0 win over Napoli.